Body & Soul Senior Fitness was incorporated in March 2008. In September 2008 we began our first class and since then we have served numerous churches in Mecklenburg and Gaston counties. We are proud to be a part of lives of these wonderful people and are excited to be able to serve them. 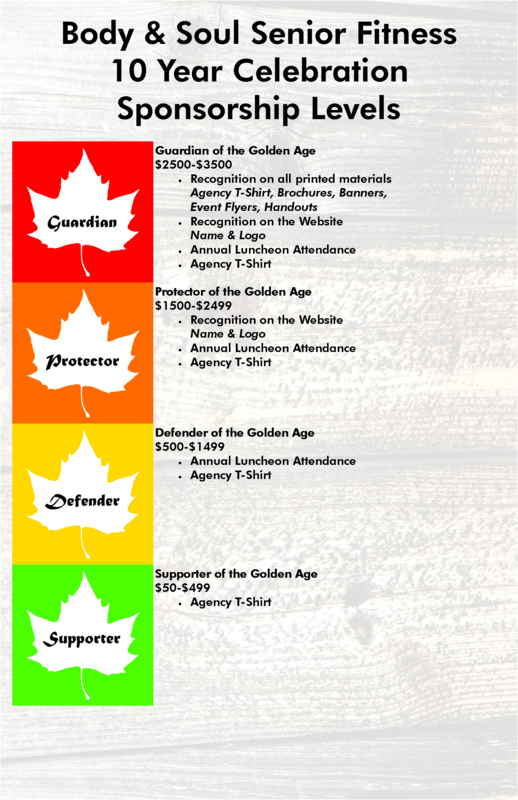 We will be having a special 10 year celebration this fall, please stay up-to-date with events and a special gala to celebrate as we look to move forward in the mission of helping senior adults live confident, independent and productive lives through physical activity, social interaction and ongoing education programs. Would you like to be a presenting sponsor for the 10 year celebration? There’s a simple way to do that. Please see the giving levels and benefits, and then complete the sponsor form. Please, watch for an email on how you can give the monetary funds to complete the sponsorship! You will receive an email on how to share logo/business information. Please, place the total here, and this is the amount that will be invoiced.